The Vietnam War pitted the United States government against two enemies. One foreign, the other domestic. The members of the armed services were caught in a pincer between a government and the public -----both of these institutions were served by the military. The avowed purpose of the United States was to protect the integrity of the South Vietnam ally. Thus, there always was a strategic ambivalence about carrying the war to the territory of the northern enemy.
" ---to know war is to know that there is still madness in the world". Senator Mike Mansfield (1971) called Vietnam "a tragic Mistake". And so America entered a war without an end game, and with a questionable threat to United States security. How do we know there was no threat? Look at the results. North Vietnam fought for a unified country under a red flag. They never attempted to extend their hegemony beyond their borders with the temporary exception of Cambodia and Laos that had fallen into the orbit of the American war with North Vietnam. Indochina was no stranger to European colonialism starting as early as 1802. Cambodia, Laos and Vietnam were dominated by France. After two wars, numerous minor revolts, international proposals, partition, there appeared to be a finality with a victory over France by the communist oriented Viet Minh in 1954. It was then that the United States concluded its security was at risk if communists were victorious in Indochina, and particulary their treaty obligation with South Vietnam was in danger. In 1955, two years after the United States had extracted itself from Korea , the nation was again confronted with a potential enemy. It appeared that North Vietnam, like North Korea, was another proxy for the Soviet Union poised to annex a fledgling democracy in the south. The Cold War strategy demanded a response. It was widely believed by the Washington establishment that a communist take-over of South Vietnam would not merely end with a Marxist victory in Vietnam. It would only be a first step that would then strike American allies in southeast Asia and then the Philippines, a gateway to American interests in the Pacific. The term "Domino Theory" was employed to colorfully describe the probable progression of communist aggression that would tip each conquered country into its adjacent neighbor. The mere hint of potential northern ambitions, and particularly their intentions to hold a national plebiscite to support unification, was sufficient reason for the United States to support an election for president in South Vietnam (1955). An election in the south would clearly separate it from any plan for unification.The United States was concerned that a vote for unification of north and south would pass and unite the country under the Red flag. The autocratic, anti communist Ngo Dinh Diem, was vehemently opposed to unification. His election was hardly a victory for democracy. He soon established an eight year corrupt and abusive government. From the outset of the Geneva partition agreement, United States presidents Eisenhower and Kennedy furnished aid to the south that included military advisers. Eisenhower, however, expressly forbade the use of American troops in what appeared to be a looming civil war. The American military attaches began as a small contingent in 1955. In 1959, two American advisers stationed at Bien Hoa were killed by the VC and the green light was given to those Americans on duty in Vietnam to defend themselves when attacked. By 1965, they numbered over 3,000. The reign of Diem created fertile territory for the DRV in the north to export its communist ideology to the south. Diem, in the south, and the North Vietnam leader, Ho Chi Minh, could find no grounds for rapprochement, and that led to a political stalemate. This was an invitation for hit and run actions against the south by NLF guerrillas in 1957. They found support throughout the country side with the local villages who found Marxist ideology appealing. In those areas where the communist dogma did not find support, villagers were physically coerced to cooperate. in 1960 North Vietnam was emboldened by Soviet Premier Nikita Khrushchev who announced to the world that he would "support wars of liberation". After the north was unable to garner international support for unification, they were encouraged to formally support the NLF actions in the south. Officially, the United States was committed to non combat roles. Sometimes the line was blurred. In 1961, the VC shot down four U.S. Army helicopters. This stimulated more advanced training, administered by more advisers, with the goal of creating an environment to reduce the American presence. The Americans were becoming more disaffected with the brutality of the Diem regime. Diem and his brother were assassinated in 1963 with the possible involvement of the C.I.A. 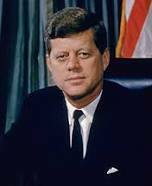 Kennedy was assassinated in November 1963 and was succeeded by Vice President Lyndon Johnson. Thus began the assassination conspiracy theories that included the Diem deaths. August 5, 1964: President Johnson addressed the Congress and reported that an American destroyer was attacked by North Vietnam torpedo boats in the Gulf of Tonkin 1964. A subsequent attack, two days later, was not correctly reported, but destined to attract great public sympathy for retaliation. "Last night I announced to the American people that the North Vietnamese regime had conducted further deliberate attacks against U.S. naval vessels operating in international waters, and I had therefore directed air action against gunboats and supporting facilities used in these hostile operations. This air action has now been carried out with substantial damage to the boats and facilities. Two U.S. aircraft were lost in the action. These latest actions of the North Vietnamese regime has given a new and grave turn to the already serious situation in southeast Asia. Our commitments in that area are well known to the Congress. They were first made in 1954 by President Eisenhower ". That the Congress approves and supports the determination of the President, as Commander in Chief, to take all necessary measures to repel any armed attack against the forces of the United States and to prevent further aggression". In the short term, President Johnson authorized the bombing of North Vietnam torpedo boat bases and oil storage depots. The new president, in private conversations, held conflicting views. He foresaw a war in Asia as quicksand and dreaded American involvement. Moreover, domestically he was thoroughly engaged in producing one of the century's greatest social policy, the Civil Rights Act of 1964. History records this feat, his greatest legacy, but Johnson's public image is inextricably frozen in the time of the United States struggle in Vietnam. The VC guerrillas struck the U.S. base at Pleiku (Central South vietnam) on February 6 . They killed 8 Americans and destroyed 10 aircraft. At the time, the U.S.public's temperature polled "for" war at an overwhelming 80%. General William Westmoreland, the commander on the ground, requested more troops for the Da Nang air base further north---closer to the border dividing the north and south. The United States long term response (March 2) was a relentless bombing campaign over North Vietnam (Operation Rolling Thunder). Four American corps would follow to South Vietnam. Their duty was to secure 43 provinces south of the demilitarized zone (DMZ) including their densely populated cities. All would become battlegrounds. Disposition of 500,000 American troops by province and city as provided by 15th Field Artillery Regiment web site. Operation Rolling Thunder represented the longest air campaign of the war. It was employed over a three year period and concentrated on bombing North Vietnam targets. 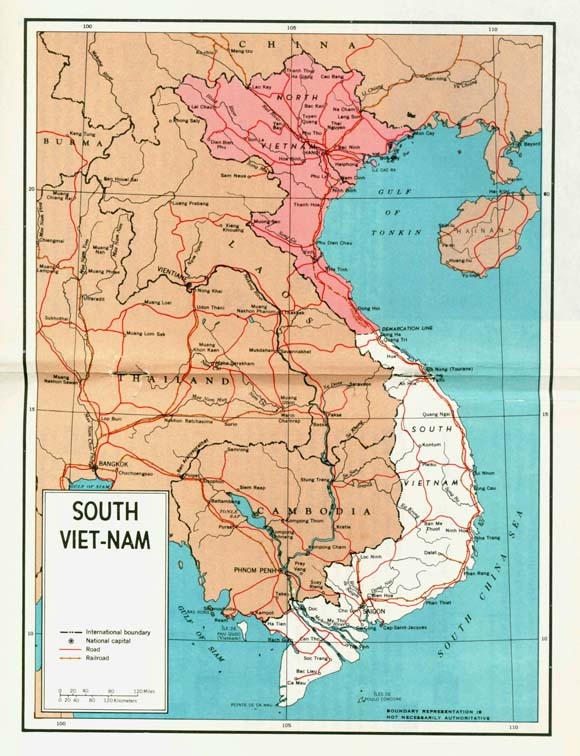 Its earliest targets in North Vietnam hugged the southern boundary, but gradually moved north as the war progressed. Geographical limitations imposed by President Johnson abetted his desire to avoid striking the north's capital at Hanoi and its port of Haiphong. Johnson's concern that extending the bombing further north might spur Soviet and Chinese active intervention. The Korean experience may have played a role in that decision. Secondarily, the president hoped that sparing the more populated northern areas from the heavy bombing would influence them to enter into talks to end the war. The frequent stops and starts of this campaign reflects this Johnson wish list. The first of many halts occurred on May 13,, but assumed shortly after the VC attack on American Special Force base Phuoc Long. Within days of the Rolling Thunder air attacks, the first combat troops, 3,500 U.S. Marines, landed at Da Nang, South Vietnam. The mission was to provide a defense for the air base that housed both the South Vietnam and U.S. air forces (March 8). The base, located on the Tonkin Gulf, (I Corps map above), was about 85 miles south of the dividing line between north and south, and destined to be a hot zone during the course of the war. The VC actively sought targets that presented the greatest opportunity. In Saigon, the south's capital, they chose the U.S. embassy on March 29. The car bomb killed 2 Americans, 19 Vietnamese and 1 Filipino. On an even darker side, Saigon would become a drug paradise for American servicemen creating a huge problem for the military and the medical corps. During June, President Johnson changed the strategy of defensive action and authorized offensive forays in South Vietnam. The south also held an election. Nguyen Cao Ky was elected Prime Minister and Nguyen Van Thieu as acting head of state. Late in July, 50,000 troops were sent to Vietnam and the U.S. draft call was increased to 35,000 each month. During the summer of 1965, American casualties mounted and particularly in marine ranks. By November, 1000 casualties per month was the new normal. On November 14, in the first engagement of the war between the U.S regular army accompanied by the South Vietnam regular army, Peoples Army of Vietnam (PAVN), met the regulars of the North Vietnam (NVA) in the La Drang Valley. This huge four day operation was supported by close air support and strategic B-52 bombing. The results were inconclusive mainly due to a northern ambush of American forces with heavy U.S. casualties. The Rolling Thunder Operation maintained its caution in choosing targets. They avoided Hanoi, but did strike oil depots on its outskirts. Hanoi got a large moral boost when the Soviets and China agreed to provide military and economic aid. In September, the Air Force began a defoliation campaign in the jungle areas about the 17th Parallel. Agent Orange is treated in our section on Air Forces as is the utilization of Napalm dropped on the VC in the Megong Delta area in December. When the year closed, there were about 400,000 Americans available or involved in active combat. There were 5000 plus deaths. At the same time, the NVA had infiltrated 90,000 regular army units into the south. After the February 8 Tet truce (Traditional New Year holiday), the peace offers to the north were still spurned. Full scale bombing resumed five days later. 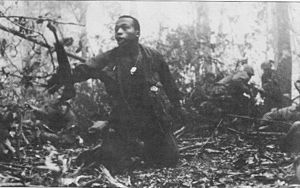 At the end of this month, 22 U.S. battalions joined ARVN forces to strike NVA HQ in the south near the Cambodian border. (Operation Junction City). According to the "History Place" this was the only operation of the war in which paratroops were dropped. 282 Americans were killed and the enemy, VC, sustained 2,278 dead. As the war proceeded, body count of enemy dead was deemed problematic. Many in the United States viewed the enemy offensive activities as an American victory. Some experienced observers called the war a "stalemate"---shades of the Korean War. Historically, that observation may have overstated the situation on the ground. The pacification efforts had failed. The enemy was well entrenched, and often well hidden, over huge areas of South Vietnam. In April, the VC, acting jointly wit the NVA, was emboldened to attack large population centers. On the 6th, they hit Quang Tri City, a provincial capital in the north central area of South Vietnam. 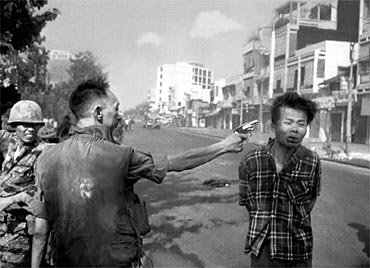 The communist forces briefly occupied the city which would again be attacked as part of the Tet Offensive begun early in 1968. The province was the center for numerous American bases and the operations of I Corps (see map above). 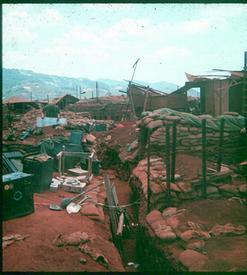 Khe Sanh, in the northwest corner of the province, was an isolated marine base and the subject of numerous enemy probes. The base was well fortified within a ring of hill ouposts that were constant targets. Like Quang Tri City, it will also be the target of the NVA's Tet offensive at the beginning of the next year. .Before April ended, U.S. planes bombed, a previously off limits, Haiphong Harbor. The prior caution to avoid this act was because the Administration was fearful that Soviet ships might be hit. Nevertheless, there were other restrictions that tied the hands of the military such as a prohibition of air strikes on enemy air bases. There was a growing concern that the VC were exerting greater control of the countryside villages. The United States attempted to counter the VC with a pacification program. A new agency was formed in May, Civil Operations and Revolutionary Development Support. Their mission was to win hearts and minds by distributing food and medication. Its efficacy was doubtful. 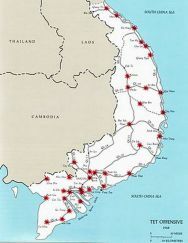 During the same month on May 18, The U.S. and ARVN forces attacked the NVA in the Demilitarized Zone (DMZ). This represented the furthest penetration north for that force. Reportedly, both sides sustained heavy losses. President Johnson was still urging a peace conference without any discernible effect. The Mekong Delta, in the extreme south of the country, is crisscrossed with waterways filtering through heavy jungle. It also was critical for supplying the efforts of the VC. The U.S. Navy established in June a highly effective force " Mobile Riverine" to interdict these supply lines with well armed river craft, "swift boats". The 50 foot boat was constructed of aluminum with a shallow draft suited for the shallow waterways. This boat description became a term of art that aimed at Senator John Kerry in his presidential campaign in 2004. He served in the Riverine force. and questionable accusations against his conduct and decoration for bravery in theater resonated with elements in the United States. Those allegations were referred to as "swift boating" the candidate. During the first week of August, the Senate Armed Services Committee received closed door testimony from Defense Secretary McNamara whose appraisal of U.S. bombing campaign was dismal. It did not change the strategy. Further bad news followed on August 21, when 2 bombers were shot down by China. In a navigational error, the planes crossed into Chinese air space immediately north of the Vietnamese border. Early in September, North Vietnam Prime Minister Phom Van Dong punctuated the dim view of the Defense Secretary when he declared that North Vietnam was committed to fight endlessly. A month long battle at Dak To began in November. This fire base in Kontum Province operated in II Corps sector. It was close to the Cambodian border. The attacking force of the PAVN was part of the strategy carried out further north in Quang Tri Province. The Dak To base lay in similar mountainous terrain as Khe Sanh lying to the north. It also was ringed by hilly outposts. The battle for Hill 882 was particularly bloody, but held by the 1st Battalion, 503rd infantry. Battles were not being measured in days, but in months. The cracks in the Johnson administration appeared in November when McNamara and other top officials resigned over the president's war strategy. Johnson radiated optimism when he visited troops in Cam Ranh Bay December 23. The area was used as a naval facility and USAF airfield located in Khanh Hoa Province, and under control of U.S. II Corps. On January 31, the NVA commenced their Tet attacks. This was a multi pronged effort over a huge swath of South Vietnam. The strikes hit countryside, villages and cities. The attack hit 36 provinces. The actions of the NVA and VC in the city of Hue was particularly barbaric. Over the course of a month long battle they executed thousands including civilians and destroyed the city. It took the efforts of three U.S. battalions to retake the city. 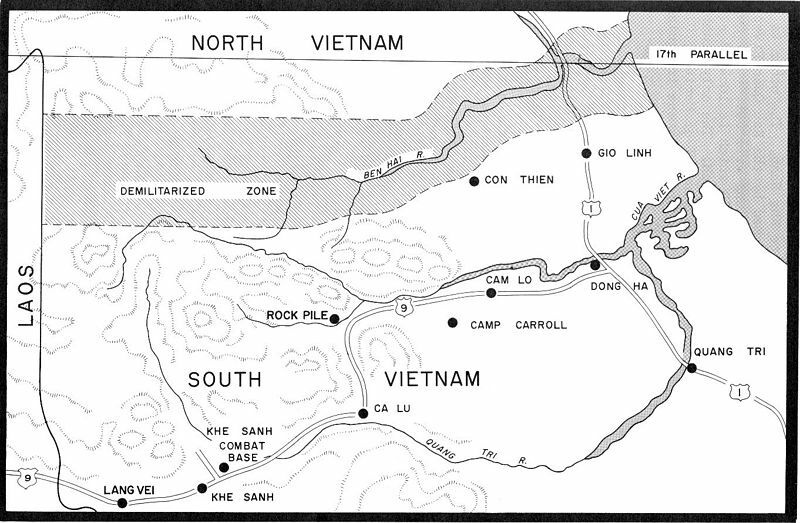 A two and one half month battle at Khe Sanh ended the same way as in Hue with the U.S. and ARVN in control. A huge aerial supply effort supported the marines, and round the clock B-52 bombing worked in concert with ground forces (Operation of Niagra II). The January 31 Tet Offensive attack on Saigon and Ton Son Nhut airbase was resolved after a month plus battle between American and ARVN troops. Americans were pitted against a large complement of NVA and VC. By March 7, the enemy withdrew after heavy casualties. They would try again. The NVA' Tet offensive was unable to hold gains although the United States had been badly surprised. The long term effect was that North Vietnam had so many casualties and materiel losses they were no longer able to mount a similar, country wide attack for the balance of the war. Clark Clifford replaced McNamara on March 1 as Defense Secretary. He immediately concluded that the U.S. had no end game and working with a corrupt Saigon government was self defeating. Two weeks later Robert Kennedy, a critic of Johnson's war strategy, announced his candidacy for president. At the end of the month, Johnson ordered a partial bombing halt. 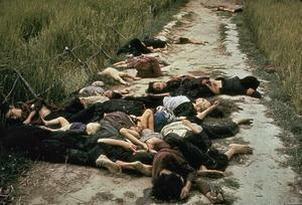 On March16, unarmed civilians were massacred by U.S. troops in My Lai village. This photo prompted change in the political fortunes of politicians and shocks the public. On March 31, President Johnson spoke to the nation on the war. At the end of his speech he surprised the country. "I shall not seek, and I will not accept, the nomination of my party for another term as your President". Johnson had prosecuted a war with one foot in--fearful of a repeat of the Korean experience that drew in the Chinese-- and one out. The former position was rejected by the doves and the latter by the Hawks. A day after the speech his poll numbers rose 15%. 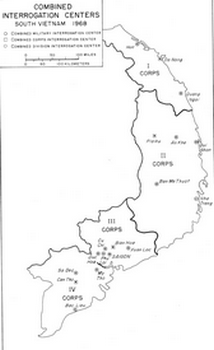 The communists, despite earlier defeats, were still targeting Khe Sanh. Roue 9 (see map above) was opened after a heavy bombing campaign. The open road brought supplies to the base camp. 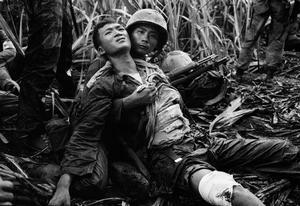 The marines and 1st Cavalry were reinforced and the NVA withdrew. On April 8, the Americans abandoned the camp and airfield. Were the casualties they sustained in vain? "What price victory"? A full scale invasion of the south was still part of the SRV plan. They attempted to force a crossing of the DMZ on April 30, and a marine battalion in coordination with air support stopped them in their tracks. 81 Marines died and the enemy body count revealed 1568 dead. 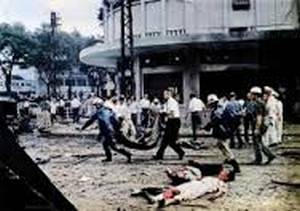 The scale of VC mortar attacks on at least 100 cities including Saigon on May 5 earned the title of "Mini Tet". It was broken with the aid of heavy air strikes. On May 10, peace talks resumed in Paris. The starts and delays of negotiations could have been taken from the Communist Korean play book 15 years earlier. For those who had placed hope for ending the Vietnam war with the election of Robert Kennedy, they sadly learned of his assassination on June 5. There was much criticism of General Westmoreland. Johnson replaced him with Creighton W. Abrams (July 1). On September 30, the 900th air force plane was shot down over North Vietnam. The context is significant when measured against the one million sorties flown over the course of the war, and the 200 daily air strikes on the Ho Chi Minh Trail in 1968. 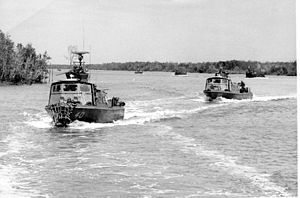 In October, the Navy, under new war department and field commander leadership, introduced Operation Sealords to sail in the Mekong Delta waterways along the Cambodian border. The purpose was to interdict communist troop infiltration across the border. Task Force 194 utilized electronic sensors that were quite effective. The earliest strategy of the war was the roll out of the Rolling Thunder bombing campaign over North Vietnam. In October 1968, three years after its inception, the operation was discontinued. A tacit admission that the campaign had missed the goal of a North Vietnam plea for peace on terms favorable to the United States. On November 5, Richard Nixon was elected 37th President of the United States having intimated he had a new strategy for the war. He used the term Vietnamization during his campaign. It was designed to build up the ARVN and gradually allow them to replace American troops. He called it "Peace with Honor". 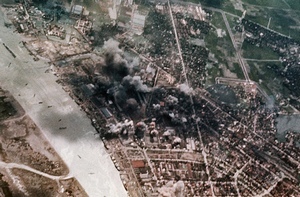 In February, the VC wasactive and attacked several cities including Saigon. There were American casualties. Following in March, the U.S. launched attacks against the NVA in the demilitarized zone (DMZ). The most significant action of March was President Nixon's order, in secret, to bomb Cambodia to destroy VC and MVA supply depots before materials were transported into South Vietnam. When Operation Menu was later disclosed by the New York Times, it provoked a popular backlash. It was later disclosed that President Nixon had air force records doctored to eliminate the evidence of the secret bombing. "United States B-52 bombers made at least 3,500 secret bombing raids over Cambodia in a 14-month period beginning in March, 1969, Defense Department sources disclosed today". On April 10, troops of the 101st Airborne attacked a remote hill in the north eastern corner of South Vietnam. 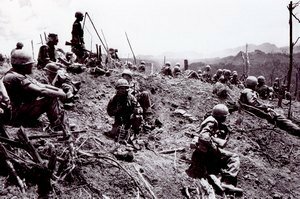 This bloody battle took the lives of 46 Americans at the location dubbed "Hamburger Hill". Inexplicably, after capturing the hill, the Americans were told to abandon the hill. On a smaller scale, this is a reprise of the Khe Sanh experience. In early July, U.S. forces began its gradual withdrawal from South Vietnam. This would continue through the balance of the year, and by December 115,000 were headed home. Forty thousand would not make it. A number that exceeded Korean War deaths. During July, Henry Kissinger, President Nixon's National Security Adviser, conducted secret meetings in Paris with North Vietnam. These unfruitful engagements would continue intermittently for two years. 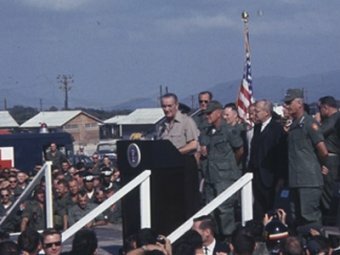 During July, President Nixon declared that the United States would actively support countries aspiring to fight off communist shackles, but not to the extent of committing American troops. In the succeeding months, and into the new year, the VC increased attacks and the U.S. responded with B-52 activity over the Ho Chi Minh Trail. Its namesake, the North's leader, died September 3. War fatigue was now pervasive on the domestic front as well as American discontent. On the battle front offensive activities had hit a period of malaise with the exception of bombing sorties during the first several months of 1970 until May. During that period, there were battles between pro American Cambodians and the communist leaning Khmer Rouge shifting in the latter's favor. However, Nixon's surprise announcement (April 30) of an American incursion , in force, into Cambodia added fuel to the fire of anti-war protests. The incursion would last 60 days with 350 American deaths. On cue in June, the U.S. Senate repealed their 1964 Gulf of Tonkin War resolution that had given the executive branch wide war powers. President Nixon pushed back claiming he had the authority to continue the war to protect American soldiers in Vietnam. Welcome to the U.S. public in August was news that the ARVN were replacing Americans at the northern border of South Vietnam. The ARVN were supported by B-52 raids on the DMZ. On September 5, the 101st Airborne and the 1st Brigade, 5th Infantry Division commenced Operation Jefferson Glenn. 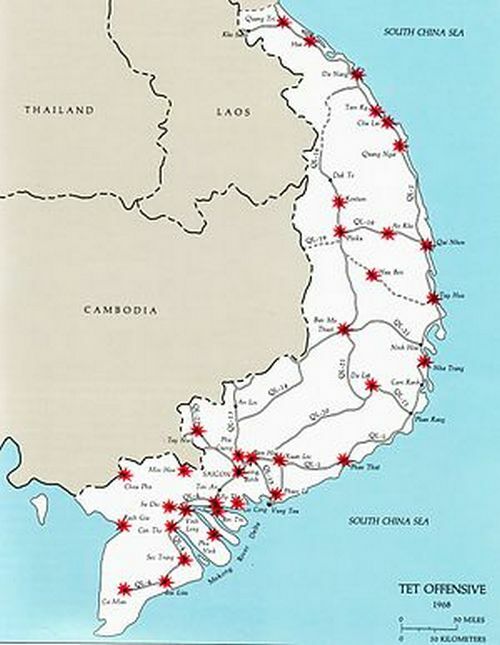 Their base of operations was the northerly province of Thu Thien where the large population centers of Hue and Quang Tri and the U.S. base at Da Nang were located. It was the last U.S. major operation of the war. "Major" is appropriate for an offensive action that lasted for one year (October 6. 1971.). This would also be a last act in Vietnam for the 101st Airborne Division. They were deployed home in March 1972. Bombing north of the 17th parallel was restricted to the DMZ but would continue in the new year against enemy supplies in Cambodia and Laos. 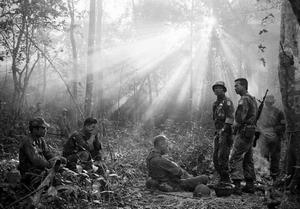 Operation Lam Son 719 was an all ARVN attack in Laos to finally block the flow of the enemy over the Ho Chi Min Trail. They were supported by USAF fixed wing craft and helicopters. The action began on February 8 and ended on March 15 in a retreat that was a near route. They lost 7000 men, 50% of their initial force. The hand writing was on the wall for the Nixon policy of Vietnamization that emphasized the build up of South Vietnam forces to replace the American troops. The Americans lost 100 helicopters and returned to their bases with an additional several hundred more damaged. In April, the U.S. Marines left Vietnam. The message was clear, On August 18, the Americans faithful allies, Australia and New Zealand, with a stake in South East Asia, announced their plans to withdraw from Vietnam. 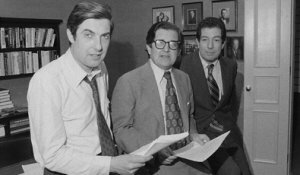 June 13 the New York Times published the Pentagon Papers that were illegally copied by Daniel Ellsberg, a government analyst, who believed the war was immoral. The documents revealed the strategies and decisions of three presidents and their staffs. Attempts by President Nixon to prevent publication ultimately were reviewed by the Supreme Court in 1973 who upheld the right of the press to publish the documents. Ellsberg was indicted for theft and espionage. The first trial was dismissed on a motion for a mistrial because of prosecutorial error. 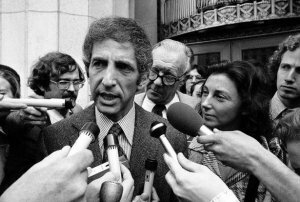 Nixon then sought evidence to defeat any Ellsberg defense in a new trial, if convicted, carried a penalty of 100 years,The White House employed men to burglarize Ellsberg's psychiatrist's office to purloin his records. When this was disclosed at trial, the government's case was dismissed. The Nixon tapes revealed his anger (May 11, 1973).
" The sonafabitching thief is made a national hero and is going to get off on a mistrial and the New York Times gets a Pulitzer Prize for stealing documents". The USAF remained active and extended their range deep into North Vietnam bombing military camps through December. 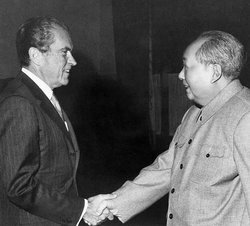 President Nixon, in an historic trip to China met with its leader, Mao Zedong, and opened a relationship with this Communist icon (February 21). In another clever bit of diplomacy, on May 22, he visited Soviet Russia and met with its leader, Leonid Brezhnev. Nixon well understood this was an end run around North Vietnam meeting with its most significant allies. In March, NVA began a seven month Eastertide offensive. They battered (April) An Loc which lay in III Corps territory. But a spirited ARVN defense over 66 days, and help from a small force of American commandos deploying with complementary air cover, they were able to triumph. However the NVA war relentless. Thet captured Quang Tri city on May 1. Responding in April/May the U.S. Operation Linebacker unleashed B-52s for heavy bombing across all areas of North Vietnam. They also used jets to mine Haiphong Harbor in an effort to cut supplies for the NVA flowing south. 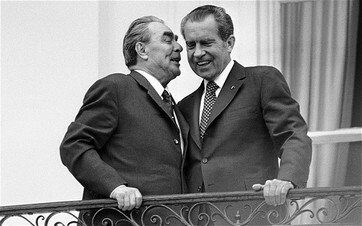 Despite a meeting with the Soviet's Brezhnev, Nixon believed that a show of power was necessary. Neither China or Russia raised any significant voice over the harbor mines. As a condition of the peace treaty a year later, the United States was obligated to remove the mines. Linebacker II was more of the same carried out by Seventh Air Force and Navy Task Force 77 over 12 days starting on November 7. President Nixon was reelected and resumed heavy bombing of the north into mid December. On December 18 Americans lost 12 planes. All attacks on North Vietnam passed the consent of the presidential desk. At the same time, peace talks in Paris failed again. The north then again demanded VC participation in any new government in the south. On August 23, all American combat troops leave Vietnam. On January 9, after only a couple of days of talks, the belligerents were in agreement. However, the south's President Thieu viewed the agreement as a sell-out. The terms left the NVA in the south. Theoretically, one country with two governments. It will not work. The Nixon administration was desperate to "get out". Kissinger had intimated that the "peace" must be attained before the next American election. On January 23, Nixon announced that "peace with honor" was achieved. necessary to replace items consumed in the course of the truce.Once the ceasefire is in effect, U.S. troops (along with other non-Vietnamese soldiers) would begin to withdraw, with withdrawal to be complete within sixty days. Simultaneously, U.S. prisoners of war would be released and allowed to return home. The parties to the agreement agreed to assist in repatriating the remains of the dead. democratic general elections under international supervision." 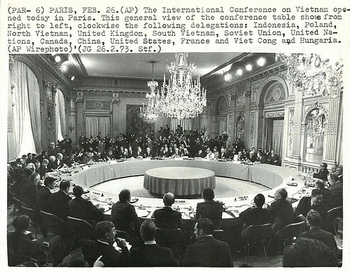 Reunification of Vietnam was to be "carried out step by step through peaceful means"
Encyclopedia of the Vietnam War, Spencer C. Tucker, Editor. ABC - CLIO, Inc. Santa Barbara, CA 1998. Stacewicz, Richard, Winter Soldiers. An Oral History of the Veterans Against the War, Twayne Publishers, New York 1997. Tanner, David, Health Care Innovation Empowered by Innovative Thinking Rockville, MD 2011. Zulu, Tony, Vietnam Nations in Transition. Greenhaven Press, Farmington Hills, MI 2004.